What an incredibly gorgeous weekend it has been. The weather was perfect. And by perfect, I mean 70 degrees, crisp, sunny, and chock full of fall fun. On Saturday we headed about an hour and a half southeast to Bellevue, MI, to Crane Fest. It was well worth the drive. Each year, thousands of sandhill cranes migrate to Florida for the winter. They happen to stop off for a rest at the Baker Sanctuary in Bellevue each year in October. Sandhill cranes are amazing and beautiful birds. They are the oldest living species of bird, having existed for over 9 million years. They are graceful, lovely, and have a gorgeous rolling trumpet song that fills the air as they join together for the evening at the sanctuary. If you’d like to read more about Crane Fest and about these beautiful birds, click here. Now, at the end of the weekend, cozied up with my sweetie, the pup, and our brand new calico kitty (! ), I’m thinking of the week ahead and what I’ll make for dinners. I’ve got plenty of squashes and root vegetables and not much time this week so I’ve got a hunch I’ll be making some soups. 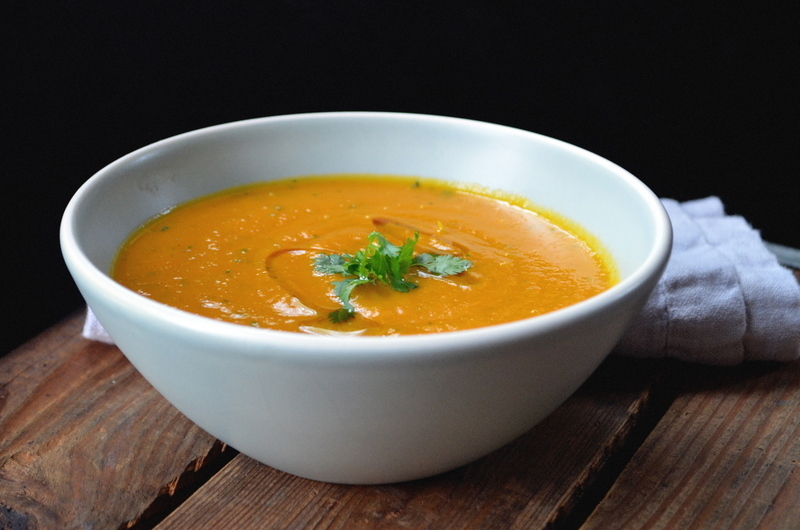 This time of year is perfect for soups. You’ll be seeing a lot of soups posted here over the next several months. As gorgeous as Michigan is in the spring, summer, and fall, winter is (though beautiful in its own way) long and cold. Perfect for warming bowls of soup. This soup is a creation of mine. 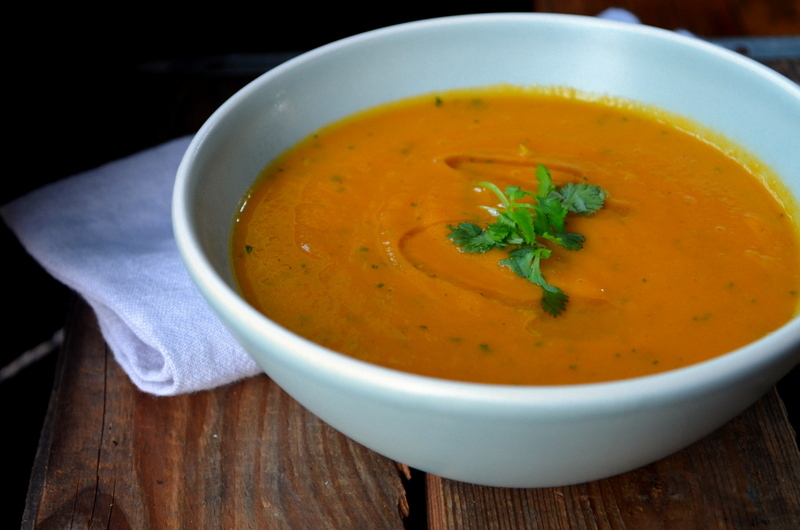 Most of the time I see carrot soup, it is carrot-ginger soup. Carrot-ginger soup is great but it’s everywhere so I wanted to make something a little different. This soup is so easy and takes only about 15 minutes hands on. You roast the veggies in large chunks until soft, add to a soup pot with broth, coconut milk, cilantro, and spices, and give it a whirl. Easy, warming, and delicious. And healthy to boot. I hope you enjoy! Heat oven to 375°. Lightly oil a 9 x 13 baking dish. Roughly chop carrots and sweet potatoes into pieces about 1 inch in size. Slice onions into thick slices. Peel garlic clove (you can leave the garlic clove whole). Place all into baking dish and cover. Roast vegetables for 45 minutes to an hour, until tender. Pour roasted vegetables into a heavy stock pot or Dutch oven and turn heat to medium. Add vegetable broth, coconut milk, cumin, coriander, garam masala, and cilantro. Be sure to save a little cilantro for garnish. Using an immersion (stick) blender (see note below), blend the contents of the soup pot until smooth. Garnish with a drizzle of olive oil and a few leaves of cilantro. If you are in the mood, sprinkle some goat cheese onto the soup. Or plain yogurt. Or pepitas (raw pumpkin seeds). Whatever you fancy! The version in the photos is cilantro and olive oil. Simply delicious. This makes a large batch of soup—you can enjoy it for several days and freeze any leftovers. Kitchen Tip: If you don’t have a stick blender, you should get one! It is one of my favorite kitchen tools. It helps you avoid having to pour hot liquids into a blender. All you need to do is place the stick blender in the soup and whirl away. You can also use it for smoothies, hummus, salsa, and so much more! But if you don’t have a stick blender today, you can use the ol’ blender method, just be careful! And put a stick blender on your wish list…! And no. Cuisinart Smart Stick does not pay me for this endorsement 🙂). Cannot wait to try this, it sounds absolutely delicious! How long do you simmer the stock and roasted vegs,, Aura? Hi Patty! Thanks! I just heated the veggies and stock until hot and steamy. The veggies will be soft from roasting so you’ll easily be able to puree at that point. If you don’t have a stick blender and need to pour everything into a blender, you may as well do that before you heat the soup so it’s less hazardous. I’ll update the recipe–thanks for the great question!